The Daytona Beach athletic program has won 15 straight conference all-sports trophies, two team national titles, and two dozen individual national titles. Our students come from more than 125 countries around the world, creating a melting pot that fosters cross-cultural tolerance and understanding. Worldwide’s highly decorated EagleVision online learning system makes for a flexible and convenient educational experience. We are committed to educating active-duty soldiers and veterans, and Worldwide was named No. 1 for online bachelor’s degree programs for veterans in 2018. We ensure equal access for students with disabilities at all campuses and provide encouragement and support in their studies and everyday activities. Find your own academic and social niche by joining some of the Daytona Beach Campus’ 150-plus clubs, including 16 fraternities and sororities. The Bradshaw Mountains and other areas around Prescott provide scenic and challenging settings for many outdoor activities. Lead an industry. Fly an aircraft. Design an engine. Predict the weather. Protect the nation. Explore outer space. With more than 100 undergraduate and graduate degrees, Embry-Riddle Aeronautical University offers the world’s most comprehensive collection of academic programs focused in aviation, aerospace, business, engineering and security. Let us help you choose the one that best fits you. For the fifth consecutive year, Embry-Riddle Worldwide has been named one of the nation’s top online educators by U.S. News & World Report. Of the 8 top-paying bachelor's degrees for 2018 — a list generated by the National Association of Colleges and Employers — Embry-Riddle offers six of the majors. Find out more about your area of interest. We are on the Florida shores of the Atlantic Ocean and at the foot of Arizona’s Bradshaw Mountains. We are around the world, and we are around the corner. Come experience Embry-Riddle’s unparalleled education around the world or at our gorgeous residential campuses in Daytona Beach, FL, or Prescott, AZ, at one of the Worldwide locations around the globe, or earn an Embry-Riddle degree from the convenience of your home using our state-of-the-art Online Learning technology. On-campus or online, join the Eagle Nation today. Select the campus of your choice. Paying a visit to one of our campuses, will make your decision to become an eagle easy. On-campus tours provide prospective students with an opportunity to meet with admissions and financial aid counselors, and professors. You can sit in on a class, and tour the dorms, student center, and dining facilities. You can even go high above the campus on an observer flight. At the Worldwide Campus we encourage you to visit the location near you or set up a telephone call with a counselor to explore the benefits of the campus’ flexible online and classroom programs. Pay a visit to Daytona Beach, FL, Prescott, AZ, or the Worldwide Campus location near you. Select the campus of your choice and schedule a visit or talk to one of our counselors today. is the average high temperature during winter at our Daytona Beach, FL, Campus. days of sunshine a year at our Prescott, AZ, Campus. Learn more about our Worldwide Campus and schedule a visit or talk with a counselor today! For flexible learning options, check out our Worldwide Campus online degree programs and global locations. 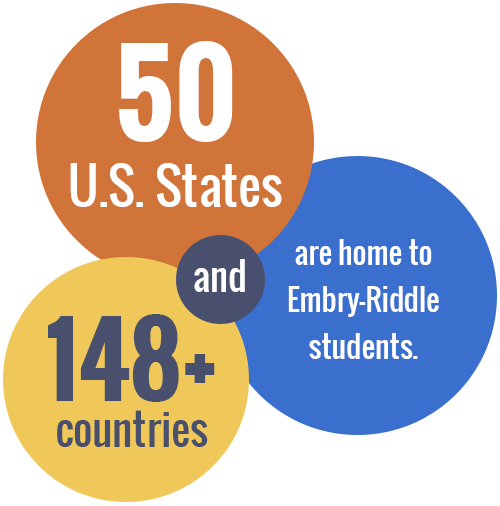 Home to students from more than 141 countries, Embry-Riddle fosters a welcoming, cross-cultural environment alongside a world-class education. Whether you are looking for a traditional on-campus experience, online learning, or a mixture of both, we offer options to suit every higher education need. At Embry-Riddle, you’ll meet fellow students from around the globe with similar passions and a drive to succeed. Our diverse campus communities encourage students to learn necessary career skills while developing their own individual abilities and strengths that help them stand out among industry competition throughout the world. Our team understands the complexity of the international admission process and provides support for important matters like immigration regulations, housing and health insurance. Learn more about Embry-Riddle international student opportunities. Select a campus and find out more about our international student life. Earning your degree, of course, comes at a cost. However, we believe an Embry-Riddle education is worth that cost — and the numbers agree. Our campus in Daytona Beach, FL ranked in the top 100 in the nation in terms of return on investment (ROI) for a student’s tuition and costs for 2018, according to PayScale.com, and our campus in Prescott, AZ ranked in the top 100 in the nation for highest-paid graduates with bachelor’s degrees in another set of rankings by PayScale.com. With the help of a net price calculator and estimated cost charts on the website of your chosen campus, you can determine your own cost of attending Embry-Riddle. Our knowledgeable financial aid counselors can inform you about the grants, scholarships, student employment, and loans available to help finance the pursuit of your career dreams. of Embry-Riddle students receive some sort of financial aid. Calculate your estimated cost of attendance. The relationship between Embry-Riddle and the military goes back to the 1920s, when the Army Air Corps taught John Paul Riddle to fly. Riddle returned the favor almost 20 years later during World War II by training thousands of Army Air Corps pilots, Naval aviators, and Royal Air Force and French pilots. That tradition lives on today in our commitment to active-duty military and veterans. In 2018, Embry-Riddle was named one the best schools for active-duty military and veterans for the fifth straight year in Military Advanced Education magazine’s Guide to Top Military-Friendly Colleges & Universities. In the same year, the Daytona Beach Campus was ranked No. 1 for veterans among regional universities in the South by U.S. News & World Report. Our Worldwide Campus was also named No. 1 in the entire nation for Best Online Bachelor's Degree Programs for Veterans for 2018. Select a campus and find out more about our military & veterans. Choosing a university and degree is the hard part. If you’ve decided on Embry-Riddle, we thank you and look forward to making the application process as easy as possible. Applications can be submitted electronically for all three of our campuses: Daytona Beach, FL, Prescott, AZ, and Worldwide. It's important for you to be familiar with the documents you'll need to complete your application. Your student status and type of degree you're seeking will impact your admission requirements. Applications are evaluated on a rolling basis. Once all necessary documents are received, we will notify you of your admission status. We look forward to seeing the next class of Eagles on campus soon! Select a campus and apply today.